Robert K. Burgess has served as an independent investor and board member to technology companies since 2005. He was chief executive officer from 1996 to 2005 of Macromedia, Inc., a provider of internet and multimedia software, which was acquired by Adobe Systems Incorporated; he also served from 1996 to 2005 on its board of directors, as chairman of its board of directors from 1998 to 2005 and as executive chairman for his final year. Previously, he held key executive positions from 1984 to 1991 at Silicon Graphics, Inc. (SGI), a graphics and computing company; from 1991 to 1995, served as chief executive officer and a board member of Alias Research, Inc., a publicly traded 3D software company, until its acquisition by SGI; and resumed executive positions at SGI during 1996. Mr. Burgess serves on the boards of Adobe and Rogers Communications, Inc., a communications and media company, and has served on the boards of several privately-held companies. He was a director of IMRIS Inc., a provider of image guided therapy solutions, from 2010 until 2013. He holds a BCom degree from McMaster University. He joined the NVIDIA board in 2011. Tench Coxe has been a managing director of Sutter Hill Ventures, a venture capital investment firm, since 1989, where he focuses on investments in the IT sector. Prior to joining Sutter Hill Ventures in 1987, he was director of marketing and MIS at Digital Communication Associates. He serves on the boards of directors of Mattersight Corp., a customer loyalty software firm, Artisan Partners Asset Management Inc., an institutional money management firm, and several privately held technology companies. Mr. Coxe holds a BA degree in Economics from Dartmouth College and an MBA degree from Harvard Business School. He joined the NVIDIA board in 1993. Persis S. Drell has been the Provost of Stanford University since 2017. A professor of Materials Science and Engineering and Professor of Physics, Dr. Drell has been on the faculty at Stanford since 2002 and was the Dean of the Stanford School of Engineering from 2014 to 2017. She served as the Director of the U.S. Department of Energy SLAC National Accelerator Laboratory from 2007 to 2012. Dr. Drell is a member of the National Academy of Sciences and the American Academy of Arts and Sciences, and is a fellow of the American Physical Society. She has been the recipient of a Guggenheim Fellowship and a National Science Foundation Presidential Young Investigator Award. Dr. Drell holds a Ph.D. from the University of California Berkeley and an AB degree in Mathematics and Physics from Wellesley College. She joined the NVIDIA board in 2015. James C. Gaither has been a managing director of Sutter Hill Ventures, a venture capital investment firm, since 2000. He was a partner in the law firm Cooley LLP from 1971 to 2000 and senior counsel to the firm from 2000 to 2003. Prior to practicing law he served as a law clerk to The Honorable Earl Warren, Chief Justice of the United States Supreme Court, special assistant to the Assistant Attorney General in the U.S. Department of Justice and staff assistant to U.S. President Lyndon Johnson. Mr. Gaither is a former president of the Board of Trustees at Stanford University, former vice chairman of the board of directors of The William and Flora Hewlett Foundation and past chairman of the Board of Trustees of the Carnegie Endowment for International Peace. Mr. Gaither holds a BA degree in Economics from Princeton University and a JD degree from Stanford University Law School. He joined the NVIDIA board in 1998. Jensen Huang co-founded NVIDIA in 1993 and has since served as president, chief executive officer, and a member of the board of directors. Under his direction, NVIDIA has become the world’s leading visual-computing company and a key player in the fields of mobile and high-performance computing. Mr. Huang held a variety of positions from 1985 to 1993 at LSI Logic Corp., a computer chip manufacturer, including leading the business unit responsible for the company’s system-on-a-chip strategy. He was a microprocessor designer from 1984 to 1985 at Advanced Micro Devices, Inc., a semiconductor company. Mr. Huang holds a BSEE degree from Oregon State University and an MSEE degree from Stanford University. Dawn Hudson serves on the boards of various companies. From 2014 to April 2018, Ms. Hudson served as Chief Marketing Officer for the National Football League. Previously, she served from 2009 to 2014 as vice chairman of The Parthenon Group, an advisory firm focused on strategy consulting. She was president and chief executive officer of Pepsi-Cola North America, the beverage division of PepsiCo, Inc. for the U.S. and Canada, from 2005 to 2007 and president from 2002, and simultaneously served as chief executive officer of the foodservice division of PepsiCo, Inc. from 2005 to 2007. Previously, she spent 13 years in marketing, advertising and branding strategy, holding leadership positions at major agencies, such as D’Arcy Masius Benton & Bowles and Omnicom. She currently serves on the board of directors of The Interpublic Group of Companies, Inc., an advertising holding company. She was a director of P.F. Chang’s China Bistro, Inc., a restaurant chain, from 2010 until 2012, of Allergan, Inc., a biopharmaceutical company, from 2008 until 2014, of Lowes Companies, Inc., a home-improvement retailer, from 2001 until 2015, and of Amplify Snack Brands, Inc., a snack food company, from 2014 until 2018. She holds a BA degree from Dartmouth College. She joined the NVIDIA board in 2013. Harvey C. Jones has been the managing partner of Square Wave Ventures, a private investment firm, since 2004. Mr. Jones has been an entrepreneur, high technology executive and active venture investor for over 30 years. In 1981, he co-founded Daisy Systems Corp., a computer-aided engineering company, ultimately serving as its president and chief executive officer until 1987. Between 1987 and 1998, he led Synopsys. Inc., a major electronic design automation company, serving as its chief executive officer for seven years and then as executive chairman. In 1997, Mr. Jones co-founded Tensilica Inc., a privately held technology IP company that developed and licensed high performance embedded processing cores. He served as chairman of the Tensilica board of directors from inception through its 2013 acquisition by Cadence Design Systems, Inc. In 2016, Mr. Jones joined the board of directors and invested in TempoQuest, a private company seeking to develop advanced weather forecasting systems that exploit accelerated GPU technology. He was a director of Tintri Inc., a company that builds data storage solutions for virtual and cloud environments, from 2014 until March 2018. Mr. Jones holds a BS degree in Mathematics and Computer Sciences from Georgetown University and an MS degree in Management from Massachusetts Institute of Technology. He joined the NVIDIA board in 1993. Michael G. McCaffery is the Chairman and a Managing Director of Makena Capital Management, an investment management firm. From 2005 to 2013, he was the Chief Executive Officer of Makena Capital Management. From 2000 to 2006, he was the President and Chief Executive Officer of the Stanford Management Company, the university subsidiary charged with managing Stanford University’s financial and real estate investments. Prior to Stanford Management Company, Mr. McCaffery was President and Chief Executive Officer of Robertson Stephens and Company, a San Francisco-based investment bank and investment management firm, from 1993 to 2009, and also served as Chairman in 2000. Mr. McCaffery serves on the boards of directors, or on the advisory boards, of several privately held companies and non-profits. He was a director of KB Home, a homebuilding company, from 2003 until 2015. Mr. McCaffery is a Trustee of the Rhodes Scholarship Trust. He holds a BA degree from the Woodrow Wilson School of Public and International Affairs at Princeton University, a BA Honours degree and an MA degree in Politics, Philosophy and Economics from Merton College, Oxford University, Oxford, England, and an MBA degree from the Stanford Graduate School of Business. He joined the NVIDIA board in 2015. Stephen C. Neal serves as Chairman of the law firm Cooley LLP, where he was also Chief Executive Officer from 2001 until 2008. 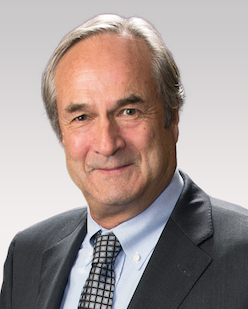 In addition to his extensive experience as a trial lawyer on a broad range of corporate issues, Mr. Neal has represented and advised numerous boards of directors, special committees of boards and individual directors on corporate governance and other legal matters. Prior to joining Cooley in 1995, Mr. Neal was a partner of the law firm Kirkland & Ellis LLP. Mr. Neal serves as Chairman of the board of directors of Levi Strauss & Co. Mr. Neal holds an AB degree from Harvard University and a JD degree from Stanford Law School. He joined the NVIDIA board in March 2019. Mark L. Perry serves on the boards of, and consults for, various companies and non-profit organizations. From 2012 to 2015, Mr. Perry served as an Entrepreneur-in-Residence at Third Rock Ventures, a venture capital firm. He served from 2007 to 2011 as president and chief executive officer of Aerovance, Inc., a biopharmaceutical company. He was an executive officer from 1994 to 2004 at Gilead Sciences, Inc., a biopharmaceutical company, serving in a variety of capacities, including general counsel, chief financial officer, and executive vice president of operations, responsible for worldwide sales and marketing, legal, manufacturing and facilities; he was also its senior business advisor until 2007. From 1981 to 1994, Mr. Perry was with the law firm Cooley LLP, where he was a partner for seven years. He serves on the boards of directors of Global Blood Therapeutics, Inc. and MyoKardia, Inc., both biopharmaceutical companies. Mr. Perry holds a BA degree in History from the University of California, Berkeley, and a JD degree from the University of California, Davis. He joined the NVIDIA board in 2005. A. Brooke Seawell has served since 2005 as a venture partner at New Enterprise Associates, and was a partner from 2000 to 2005 at Technology Crossover Ventures. He was executive vice president from 1997 to 1998 at NetDynamics, Inc., an application server software company, which was acquired by Sun Microsystems, Inc. He was senior vice president and chief financial officer from 1991 to 1997 of Synopsys, Inc., an electronic design automation software company. He serves on the board of directors of Tableau Software, Inc., a business intelligence software company, Tenable Holdings, Inc., a cybersecurity company, and several privately held companies. Mr. Seawell served on the board of directors of Glu Mobile, Inc., a publisher of mobile games, from 2006 to 2014, and of Informatica Corp., a data integration software company, from 1997 to 2015. He also previously served as a member of the Stanford University Athletic Board and on the Management Board of the Stanford Graduate School of Business. Mr. Seawell holds a BA degree in Economics and an MBA degree in Finance from Stanford University. He joined the NVIDIA board in 1997. Mark A. Stevens has been the managing partner of S-Cubed Capital, a private family office investment firm, since 2012. He was a managing partner from 1993 to 2011 of Sequoia Capital, a venture capital investment firm, where he had been an associate for the preceding four years. Previously, he held technical sales and marketing positions at Intel Corporation, and was a member of the technical staff at Hughes Aircraft Co. Mr. Stevens serves as a member of the board of directors of Quantenna Communications, Inc., a provider of Wi-Fi solutions, and, is a Trustee of the University of Southern California. Mr. Stevens holds a BSEE degree, a BA degree in Economics and an MS degree in Computer Engineering from the University of Southern California and an MBA degree from Harvard Business School. He joined the NVIDIA board in 2008 and previously served as a director from 1993 to 2006.